Hi I'm new here, I purchased a 10 palladium C63 with 59k on christmas eve as a gift for myself, two days ago I took the front wheels off and removed the front bumper to change out the lower grille, put the car back together carefully and as I am leaving my house, I get a bing followed by, BRAKE EBR ABS and ESP Inoperative accompanied by stiff steering, surely I thought I damaged a wheel sensor somehow, I bring it into MB and the SA says oh don't worry happens all the time, we will scan it and tell you which sensor it is. After a few mins of waiting the tech grabs me and says hey I have to show you something, he shows me the diagnostic computer is claiming there is a internal fault with the ESP module itself. What do you guys think? 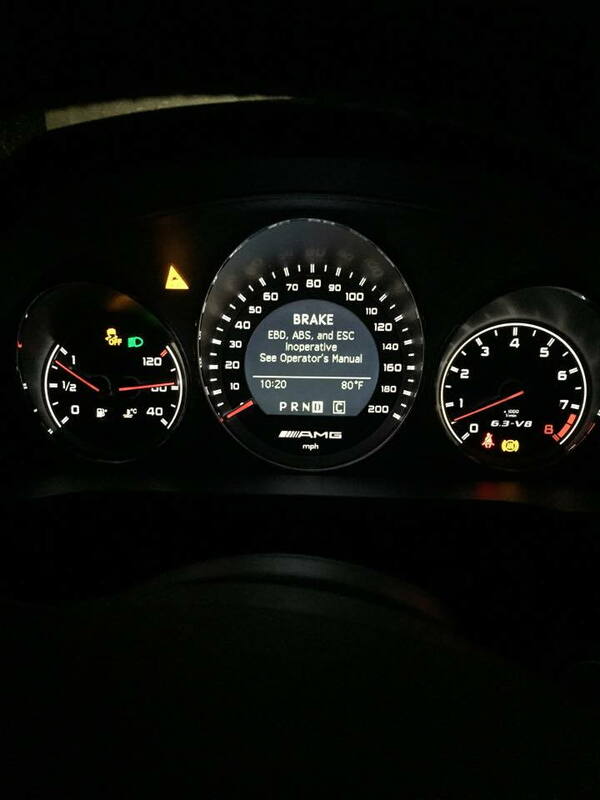 the car was perfectly fine prior, I am almost certain I did not do anything, I checked all fuses, checked the connections to the wheel sensors, I also want to note that if I start the car up there is no warnings, its when you begin to drive for a few seconds it kicks in. Which is why I swore it was a wheel sensor. I probably have this module if a 09 will work. Where is it located? its the electrical module box on the abs hydraulic unit. Usually these are vin coded, mated to the car but i cant say i've done one on a 204 in a long time. It'd definitely not common but like anything electrical it can take a dump at any time, you never know. Sometimes it just wakes up on the wrong side of the bed and will reset and never come back if your lucky . Message pops up when the car gets past 5mph. Before then all systems are fine then message pops up and power steering shuts off. Getting it towed to the dealer tomorrow - God I hope it's not the head bolt issue. Car was running just fine before this. Fired it up in the morning to go to work and there it was. If you google the message some people with similar issues state the error was due to a wheel speed sensor. I have gotten the ESC a couple of times upon starting the car. Car's RPMs shoot a little over 1k at idle. I usually turn it off and back on again and it goes away. It does leave a CEL but it clears in about a day or so. Very weird. I've had this come on here and there in the winter but go away after a power cycle. Now it comes on every time after re-starting and moving a few feet. It happened to me one time two months ago. When it happened ,I tried to restart the car hope it goes away but it comes back everytime when the car about 5 mph and when the door auto lock kick in, so I decide to disable the auto lock function and see. And it goes away until now.So far so good. Hope this will help. I tried disabling the auto door lock, no dice. For me it's once I go over 20kph (~12mph), the door locks actuate before that speed. If I keep it under 20kph no error so it's not a time duration either. Just speed. This is common when the battery is getting weak. I had the same warning that came out of no where. Use a multi-meter to check volt out put when the car is off and when running. Chances are your battery will fail a load test if you check the battery. Change the battery, problem solved, for me at least. I cleaned all the hub sensors to fix my problem. i had a similar issue pop up yesterday, except it is EBR, ABS and ESP. took it to the dealer and after 3 hours they couldn't do anything with it because they couldn't get the message to pop up. seems to only happen on a cold start.. once the car gets up to temp, i can restart and it's fine until the next cold start. battery makes sense. my car is a 2009 with 117k so it's up there in age and i don't think i've ever changed the battery. i will also have them check the wheel speed sensors when i drop it off after the holidays. Last edited by drawde; 11-25-2015 at 05:48 PM. I agree that happened when I left the car a bit long without driving it. God I hope it's not the head bolt issue. I take it this statement was a joke. In my case, I think it was just brake dust buildup on the hub sensor ring. The sensor itself is very protected. I still removed them, cleaned the sensor casing and the housing. had this happen on one of my AMG cars in the past and it was the wheel speed sensor, like a few others mentioned. was it wheel speed sensor for the specific problem in OP? or is it generally for these types of issues? mine is EBR, ABS, ESP.. I took out the wheel speed sensors and attempted to clean them. It didn't do anything. I had the same problem with the same fix. ESP control module was bad. $1,650 after taxes and installation.